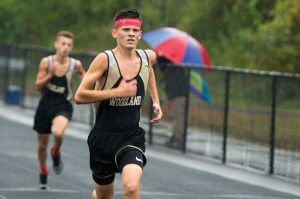 BEACON FALLS — Despite passing their biggest tests of the regular season, Woodland cross country coach Jeff Lownds isn’t ready to crown his Hawks just yet. Both the boys and girls squads completed sweeps of Derby, Kennedy and Sacred Heart on Oct. 2 at Woodland. The Derby girls and Kennedy boys are the defending Naugatuck Valley League champions. The Hawks relied upon their quality depth to sweep the meets. On the boys side, Woodland claimed the second- through fifth-place finishes to hold off Kennedy, 22-37. Greg Aldrich was the top finisher for the Hawks with a time of 18:23. He was followed by Chase Young (18:28), Kyle Crowell (18:36) and Colin Slavin (19:11). It was similar scenario on the girls side, where the Hawks claimed the third- through sixth-place spots to edge Derby, 26-33. 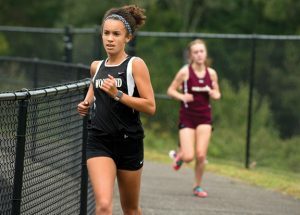 Jaden Young paced Woodland with a time of 20:59, and she was followed by Chloe Poulos (21:12), Emma Slavin (21:32) and Calisa Costanzo (21:52). Jill Brotherton (ninth, 22:23) and Brooke Iannone (10th, 23:22) also placed inside the top 10. Woodland’s performance followed in line with Lownds’ philosophy of keeping his runners in a pack rather than allowing them to separate too much. The results were the Hawks’ tightest victories of the regular season and demonstrated that there’s still room for improvement entering the championship portion of the season. The boys and girls teams both finished the regular season perfect at 14-0 by sweeping the final regular-season meet on Tuesday against Oxford, Crosby and Torrington. On the boys side, the Hawks once again claimed the second through fifth spots. Aldrich finished second overall in 18:23. He was followed by Crowell (18:44), Young (19:28) and Slavin (19:47). Cole Verrelli (seventh, 20:28) and Marty Swercewski (ninth, 20:32) gave Woodland seven runners in the top ten. The girls took the top seven spots. Young won the race in 21:02. She was followed by Slavin (21:13), Poulos (21:33), Costanzo (21:42), Brotherton (22:40), Iannone (23:14) and Kayla Drmic (23:19). Siena Liscomb finished 10th (24:46) to give the Hawks eight runners in the top ten. The Hawks will now turn their attention to the postseason. The NVL championship meet is set for Oct. 17 and the state meets are scheduled for Oct. 27. Editor’s note: This story has been updated from the version that is published in the Oct. 11 edition of the Citizen’s News to include information on meets after press time.